Dive Action regularly runs dives on Sundays, with two boat launches being the norm, the first at 8.30am and the second at 11.00am. Call us on +27 (0)21 511 0800 or email shop@diveaction.co.za to book a place on these dives. 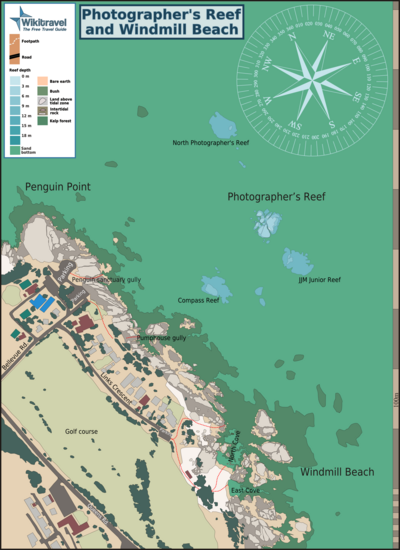 Below are some of the shore dive sites of the Cape. We can also arrange a Dive Master to lead your dives should you wish to discover the Cape waters from the shore and provide you with an insight into the incredible and diverse sea life found along our coast. The dive site Long Beach (Simon’s Town) is a shoreline sand bottomed site with scattered wreckage and reef areas in the Simon’s Bay area on the False Bay coast of the Cape Peninsula, part of Cape Town in the Western Cape province of South Africa. 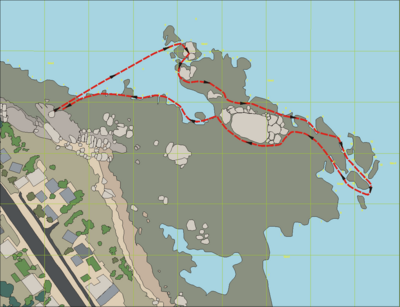 There is an underwater trail for compass navigation training.The site may occasionally be closed for diving when foreign warships are in Simon’s Town. S34°11.239’ E018°25.574’ (at the “Slipway” shown on the SAN chart). Behind the Simon’s Town railway station. This is in a Marine Protected Area (2009). A permit is required. The dive site Windmill Beach is an inshore rocky reef in the Froggy Pond area of Simon’s Town on the False Bay shore of the Cape Peninsula, near Cape Town in the Western Cape province of South Africa. Sand bottom with large granite outcrops and boulders, some with very high relief, extending from flat sand to near or above the surface. Slowly shelving beaches. The north cove is very gradually sloping sand near the beach, but gets rocky near the mouth, where the depth gets down to about 3 to 4m. In this area there are lots of small boulders which provide shelter for a variety of invertebrates and fish. At the mouth it gets deeper quite suddenly over a rocky ledge, and drops down to sand bottom which continues all the way north to Photographer’s Reef and beyond. There are a number of pinnacles in the area to the north east and east of the north cove. The south cove initially slopes more steeply and remains mostly sand bottom. It flattens out soon and is bordered by rock on both sides. 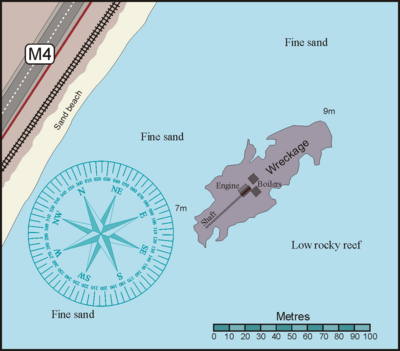 The wreck lies in fairly shallow water the area is mostly fine sand with occasional low sandstone outcrops. The iron structure of the wreck has become very broken up over the years. A section of the triple expansion steam engine framework structure extends above water, with the low pressure cylinder mountings to the south west. The crankshaft, connecting rods and propeller shaft with large cast iron propeller are still in place. There appear to be the remains of a condenser on the port side of the engine. Just forward of the engine are the remains of the two coal-fired scotch boilers. Both have been dislodged from their mountings, and are lying on their sides with the cylindrical furnaces lying one above the other. The walls have rusted through in places and the tie-rods are clearly visible the wreck lies at about 45° to the shoreline. The bow at the north east end is about 30m from the engine block and is the deepest part at about 9m. The plating has largely rusted away, but a fair amount of framing is still recognisable. The stern at the south west end is about 15m from the engine block and is both the shallowest part and closest to the beach. Most of the wreckage is very low, but there are a few places where it is possible to get into covered areas. The site is reasonably easily accessible and is one of the most popular shore dives. It has areas which are suitable for open water training of novice divers as well as reefs with a wide range of interesting invertebrates. Outlands Point is the first point south of the Froggy Pond area. There is a small group of houses on the seaward side of the main road, and more houses up the mountainside. It is easily recognised by the large flattish topped granite boulder just offshore. This site is in a Marine Protected Area (2004). A permit is required. The site is partly inside the Boulders Restricted Zone. Those parts east of the big rock are outside the restricted zone. Sand bottom with bedrock reef and big boulders, some breaking the surface. There are a few swim-throughs among the boulder groups north of the big rock. The big rock is pretty sheer on the south face, with a few deep crevices and overhangs. There are several medium sized boulders a little further to the south. The seaward end of the big rock is also quite sheer, with a small cave, and is on a low flattish outcrop. A ridge of medium height extends beyond this outcrop, with another parallel a few metres to the north west of it. These ridges end about 25m east of the big rock, and a large sheer sided boulder rising from the sand bottom at 10m, to 3m below sea level stands a bit beyond. Beyond this is a group of lower steep sided outcrops, about 8m away to the east. There is a relatively high and small one to the south of the group and a much larger but lower one to the north. The gap between them is about 2m wide with a sand bottom. North of these rocks is an area of sand bottom at 10m depth with extensive patches of black mussel. The reef that extends beyond the big rock has a sand patch to the south with some medium and fairly high outcrops. The sand is loose and fairly coarse in this area. To the south of the big rocks there are some large and medium outcrops and boulders, a few of which nearly reach the surface, and an extensive area of scattered small boulders and outcrops with sand bottom between, getting rockier towards the shore. A shore dive site which is suitable for training exercises as it is sheltered and has a flat sandy bottom. 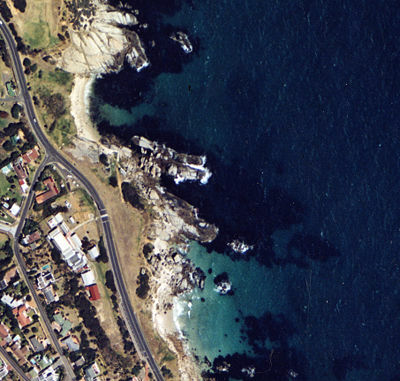 First little cove south of the golf course in Simon’s Town This site is in a Marine Protected Area (2004). A permit is required. The site is entirely inside the Boulders Restricted Zone. Shallow, the 10m contour is about 200m out at the end of the reef south of Froggy Pond . Froggy Pond cove seen from the roadside. This is a very sheltered little bay and not very deep. A suitable site for training exercises on the sand, but an interesting dive along the reefs. Sandy beach with boulders in shallows. Quite steeply shelving at the shoreline. Rocky reefs to both sides. Huge granite corestone outcrops with some dolerite dykes at south end of beach form a wide point separating Froggy Pond from Fisherman’s Beach to the south. The point continues out to sea as a reef of medium to low outcrops on a sand bottom. Inshore the sand is loose and clean and fairly coarse. Further out there are places where it is finer and others where there is a coarse overlay of granular shelly sand. There are some narrow deep crevices in the rocks of the point which shelter a surprising variety of organisms.